Are you planning on modernising or designing a completely new bathroom, and possibly looking for more information about technology and trends in bathroom design? 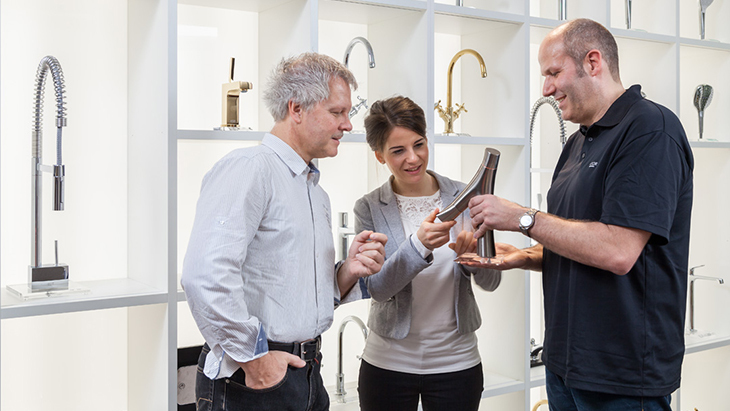 Our competent consultants will take the time to answer any queries that you have about Hansgrohe and AXOR products, explain functions to you and show you how the products can be combined with one another. If you already have a bathroom plan, please bring this with you when you come for your personal appointment at the Hansgrohe Aquademie. The consultancy service is, of course, free of charge. You can even combine your appointment with a stimulating visit to our Showerworld. Nothing is more convincing than getting first-hand experience of the Hansgrohe and AXOR products. Consultation takes place every Tuesday, Wednesday and Friday between 1.00 pm and 6.00 pm. Please arrange a personal appointment well in advance, at least one week before your planned visit. We look forward to receiving your reservation.